It's Facebook Fridays! for December 1, 2017, and we want to enhance your ability to see clearly! 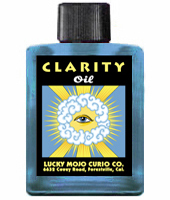 The Lucky Mojo Curio Co. is hosting a random drawing to give away 5 enlightening Clarity spiritual supply prizes to open the doors of perception and do away with muddled confusion. 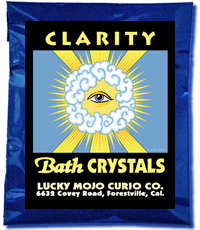 This week each lucky winner will receive a packet of genuine Lucky Mojo Brand Clarity Bath Crystals, plus a bottle of hand-made Clarity Dressing Oil. Dissolve a little bit of the crystals in warm water and wash your face, then employ the oil to fix a small altar light candle and anoint your third eye, as you pray to see the truths and the lies around you, to bring in helpful messages and signs of divination and prophesy, and to experience important insights relating to your past, your present, and your future. We have a winner! In fact, we have 5 lucky winners! Our Facebook Fridays! winners for December 1, 2017 are: Cheryl V Mitchell, Nathen Steininger, Laurel Lazuli, Lisa Decker, and Georgette Nicolaides.